I have to warn you. This newsletter is longer than the usual 250 words. It’s been over 9 months since I’ve written a newsletter and I wanted to share why I’ve largely been silent – why I barely talked to friends and family and didn’t communicate with my tribe of WOBO women. The easy answer is I did what I’ve always done to deal with hurt, disappointment, fear and anger. I shut myself down. I learned growing up it was best to swallow negative emotions and pretend like they didn’t matter. As a way to deal with the dysfunction, I took on the role of the invisible one; the one to not rock the boat, not to cause any discomfort, to be perfect and not a bother. I know that not allowing myself to feel my emotions had a lot to do with becoming a WOBO woman who hit-the-wall. Spending 45-plus years holding it all in, never letting on that I was human was depleting and ultimately debilitating. And while I had transformed what I ate, how I exercised, my work life, how I thought about life, and my spiritual foundation, I had yet to poke around with healing my emotional health. Not anymore! I have Donald Trump in all his fucked-up-ness to thank for being a YUGE trigger [clearly not just me either]. The hate, relentless negativity, and unkindness that permeated his campaign and now his presidency tested my go-to-strategy of “hold it all in and soldier on.” It was tested and failed miserably. So with a failed lifetime strategy on my hands, I felt I had no choice but to retreat. I couldn’t control my feelings. They were boiling over and I was going to explode. The last thing I wanted to do was make small talk, smile and play nice, or cheerlead anyone. Kale was not going to fix this. 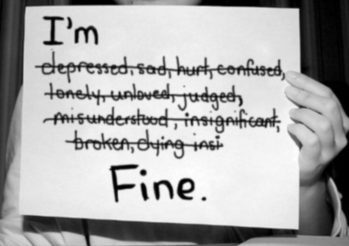 I was not functioning and something needed to change. So being an off-the-charts “J” on the Myers-Briggs, I wrote a pro-con list of what this 9 month “go off and lick my wounds” hiatus had going for it. PROs – no physical or verbal fights; no being judged harshly. That’s it for positives and they are not that damn positive. 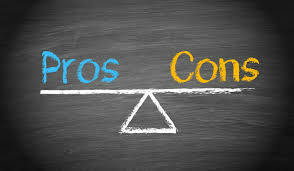 CONs – no joy or peace, missed opportunities for deeper connection and love, lost income & business opportunities, anxiety and depression, feelings of isolation and loneliness, fatigue and way more sugar than I’ve consumed in a long friggin’ time. What do you think when you read that list? I lost out on way more than I gained? That’s how I saw it anyway. I realized my way of dealing with my emotions was creating the very situation I was sick of living – exhausted, disconnected, depressed, and unfulfilled. So for the 2nd time in my life (the first was after my mother’s death), I said, I’m done! I want to live a joyful life and this was not going to get me there. So what did I do in the midst of such a dark period to get unstuck? I got a coach. I’ve always worked with coaches – athletic, health, business, career – and it had been over a year since I’d worked with one. This coach is helping me heal my heart and soul. God Bless her! I allowed someone to do for me what I do for my clients. I stopped pouring gasoline on the fire. I wasn’t going to escape the flames if I continued to put more fuel on. For me, that meant not being obsessed with the news. Instead of reading it all day long, every day, I only check in the morning and evening. I check my notifications on Facebook to make sure everyone is ok and I don’t read anything else. I had to own the feelings of hurt, anger, fear, and disappointment and I had to tell someone. OMG! This was really terrifying. My throat would tighten and get dry as a bone at the thought of it. Find someone(s) you can truly confide in and feel safe saying what you feel. It was a huge release. I examined my reactions. Life is full of ups and downs, as well as good and bad people. I can’t control any of it but what I can control is how I choose to react to it. I needed to be able to function and be productive regardless. I worked on identifying what was driving my strong reactions to our current political climate. It turned out to be grief, rage and disappointment. I’m still working through it but am feeling 100x lighter and happier for it. I focused on the positive. It matters. We can sit and spin in the bad feelings and negativity forever and nothing will change. In order to move past the unwanted feelings you have to allow them to be – but approach them from a place of positivity because you want to feel better, you want the situation to be better, you want to be better. You guys, this is a big deal. I am the one who looks like I have it all together; the one others come to, the one who’s solid. The thing is – I am solid and I am also an emotional human. The idea of being both has been so damn freeing. 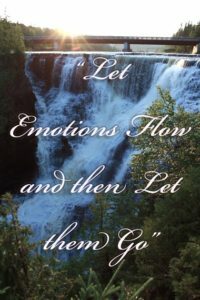 Letting my emotions flow has allowed me to let them go. Feeling stuck? In retreat mode? I’m here to help. No longer is being worn-out and burnt-out (WOBO) acceptable. Life is good and you deserve a good life, an incredible life. Check out my upcoming programs and events for ways to take a step forward. Just one small step is all that’s needed. Please share your thoughts and comments. I want to hear from you. You’ll help me keep going toward the light, likely free yourself in some way, and will surely inspire action in someone else. This is very brave. One of the things I’ve had to learn this year is to ask for help, to be vulnerable, to admit that I didn’t have all the answers. And it was OK! It didn’t make me less strong or less competent. Glad you’re back and on the case. We WOBOs need you! Dear Marva: it’s so wonderful to have you back! I’m sorry you felt you had to go through this alone, and it’s very courageous of you to share your feeling like you did here. I know the election was hard on many of us, but I’m hopeful that it will inspire more people to really examine what’s important, what unites us, and get involved. Please call or visit any time. Sending you love!